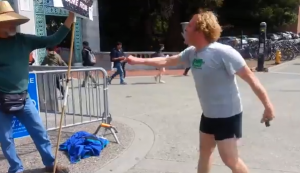 BERKELEY — A video was recently posted on YouTube that captures a barefoot atheist jogger screaming at the top of his lungs for nearly ten minutes at a Christian man holding a sign in opposition of atheism. The video, entitled How Not to Defend Atheism, begins as a man stands quietly holding a sign on the campus of University of California at Berkeley. “In five seconds, I can hand you proof that God created the heavens and the earth, and that Jesus Christ can save your soul,” reads one side. “It’s easy to be an atheist when you don’t think about where everything came from,” reads the other. As the man holds the sign, another man with curly blonde hair and black shorts paces back and forth, obviously agitated by the message. “How free are you?” the man asks. “Are you capable of a two-way conversation?” the man holding the sign asks calmly. The jogger then replies that he must scream in order to be heard, and continues his rant. “Why are you afraid [of discussing this with me]?” the Christian holding the sign asks. “You have no redeeming factors whatsoever, and the only reason we allow you to live is because we don’t stoop to your level!” he exclaims. “So much for democracy, eh?” the man holding the sign replies. The jogger, who had been pacing and flailing his arms as he screamed, then comes running toward him in furor. Moments later, the camera swings back to show that by this time, a crowd has gathered. A woman then speaks up and asks the man why he is behaving wildly. “He’s not even violent right now,” she states. “No, but his ideology supports violence,” he replies, still heated. “I’m Christian, too, and I would never do that to you,” the woman says. At this point, a male student approaches the man and offers help, commenting that the man appears to be “losing it.” The jogger tells him that he is just fine. Two female campus police officers approach seconds later and attempt to urge the man to lower his voice. “I will take a different route next time if I am going to be bothered by these superstitious morons and their (expletive)!” the jogger declares. He then takes off running and still can be heard screaming in the distance. Reaction to the video has been mixed. “Boy, got it over on them good,” one man wrote.